This header picture was presented to the Melba Valley Historical Society. It shows the view from the escarpment to Walter's Butte and the gold & silver laden Owyhee mountains of Idaho beyond. 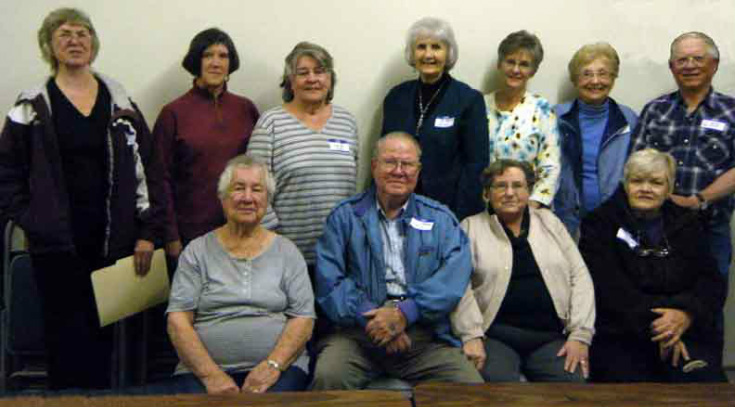 The first organizing board of the Melba Valley Historical Society formed in March 2013. Martha Hilton Hasselbring, Director; Linda Morton-Keithley, Director; Beverly Wylie Robinson, Director; Ann Pettijohn Tomlinson, Director; Jane Zeyer, Treasurer; Peggy Friddle Frisch, Secretary; Bob Miller, Vice President; Madge Cook Wylie, Historian; Doug Parsons, Director; Ruth Parsons, Director; Trudy Rowen Hafen, Director. Not pictured - Dennis & Laura Shelley, Directors. Memorial: Our faithful board member Doug Parsons passed away on August 9, 2014. He was born in 1938 and graduated from Melba High School in 1956. He served in the U. S. Air Force for 20 years, returning to Idaho in 1979. In July of 2014, he and his wife Ruth were named "Citizens of the Year" for the 4th of July parade. He faithfully attended every Historical Society board meeting, and will be greatly missed. Additions to the Board are Dennis and Laura Shelley. Jane Zeyer resigned as Treasurer and Ruth Parsons took her place. Vice President elected February, 2015 - Beverly Robinson.